The Brewster Trust assisted the Barbados Secondary Schools’ Football League (BSSFL) with the organisation of another coaching course for the BSSFL coaches. 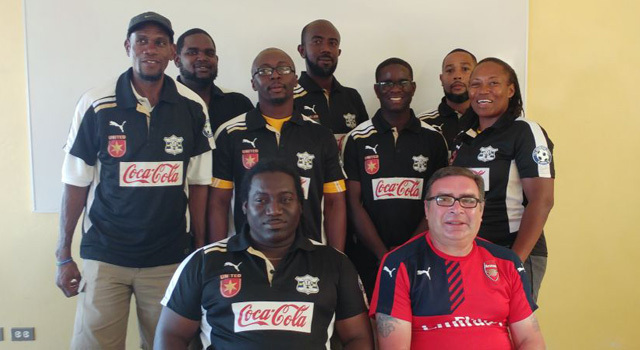 The course took place at the at the Samuel Jackman Prescod Polytechnic from Monday, 23rd January, to Wednesday, 25th January, and was conducted by Arsenal FC coach Steve Davies. The content has been structured around the UEFA B and FA Youth Module Level 3 courses. On each of the three days there was a different focus, Monday-Midfield, Tuesday-Attacking and Wednesday-Defending. The sessions consisted of various functional practices as well as different phases of play. Each session began and finished with warm ups and cool downs that were team based. Davies used these activities as examples of how team briefs and de-briefs can be incorporated into warm ups and cool downs. In addition to the practical work, he explained the importance of developing an environment that is enjoyable and comfortable for players to learn in, and of ways of motivating players. The group also spent classroom time discussing tactics and team selections. Throughout the course, the participants took part fully and engaged very well, there was a lot of open dialogue and two way communication. Unfortunately, there were less participants than the organiser was expecting, so the BSSFL coaches weren’t able to deliver any of their own sessions.